Nature's Building Blocks is an alphabetical listing of all known elements with each one being discussed under the following headings: derivation of the name; its presence in the human body and in the diet; its possible role in medicine; the history of its discovery; its economic importance; its role in warfare; its environmental impact; its basic chemistry; and finally a section 'element of surprise' which reveals some unexpected aspect. By the time I had compiled my data book The Elements I had collected a lot of fascinating material about each element but which was not suitable for a book of numerical data. I then suggested to Oxford University Press that I should write a similar book, but one that was aimed at a wider audience, and they agreed. What made this book different from other books about the elements was that I arranged them in alphabetical order. Of course, from a chemist's point of view this may seem silly - an order based on the periodic table would be more logical - because it results in a random arrangement. However, for the general reader it makes the book so much more user-friendly and this has been commented on by reviewers. A second edition has just been published and I was surprised just how much extra new data about the elements I'd collected in the 10 years since the first edition. 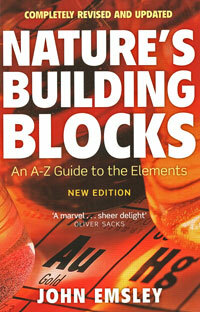 Buy Nature's Building Blocks: An A-Z Guide to the Elements from Amazon. *The elements section has individual entries for every named element. There are also sections on the group known as the lanthanoids (atomic numbers 57–71), for those known as the transfermium elements (with atomic numbers greater than 100), and for elements yet unnamed (atomic numbers 113 and above).